Wildfire is a natural process in a forest. Fire cleans the forest floor and nourishes the soil, clears pests from the trees, and even helps with reproduction of many species of trees. From a non-human perspective, wildfire is refreshing, cleansing, and a bringer of new life. However, as our human presence spreads more and more into the wilderness, a new stakeholder is introduced into the wildfire matrix. For us, fire is a two-edged sword. It is the cornerstone of our identity as modern humans - ancient Greek mythology tells the story of Prometheus, the Titan who brought fire down from the Gods on Mount Olympus to humans. Our use of fire as a tool is one of the attributes that defined our species. On the other hand, fire is also a symbol of death and destruction. Fire is associated with the underworld - the medieval poet Dante Alighieri titled part one of his famous epic poem Inferno. Although we still use fire every day in our lives, fire can easily get out of our control and result in incredible loss of life, resources, and money. For us, fire is not life-giving - it is life-taking. With increasing human presence in our national forests, including campers, hikers, as well as historic buildings and lodges, wildfire poses new risks: hikers and campers are in danger of being trapped in the flames; important timber resources are being lost with each acre burned; cabins and homes in the national forest or just outside of it are lost. Wildfire has become a central topic in the growing discussion of the blurring boundary between humans and wilderness, and between natural and unnatural. One way that this relationship manifests in architecture and historic preservation is in fire lookout towers. Fire lookout towers don't only exist in national forests in the western United States. These towers have been in use all over the country for over a century to help spot and suppress developing wildfires. Even with today's advanced monitoring technology, hundreds of towers are still in use across the United States. Others have been preserved and repurposed for different uses. Many can be rented out for recreational camping purposes. In honor of the 50th anniversary of the National Historic Preservation Act, the US Forest Service initiated a "16 by '16" program to preserve 16 fire lookouts by 2016, a goal which has been accomplished. 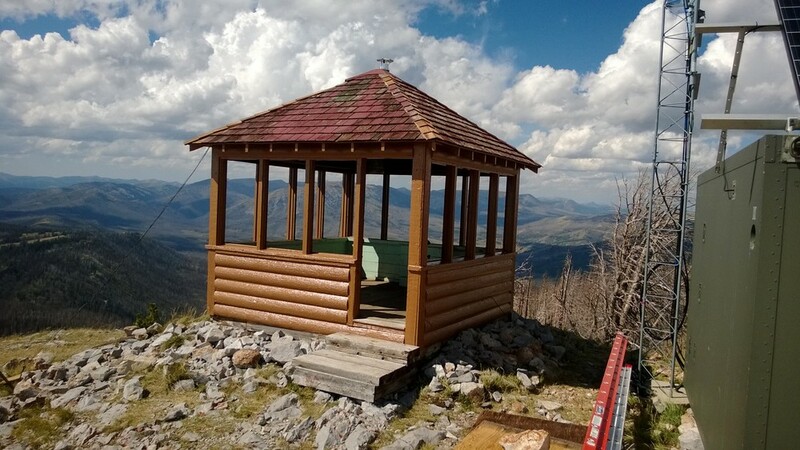 Wyoming has its fair share of fire lookout towers, and five towers have been saved in the Medicine Bow-Routt National Forest alone, many with the help of Historicorps. Historicorps is a nonprofit organization that provides volunteers for historic preservation projects on public lands all across America. Our relationship with fire goes way back, but we are still engaged in a constant negotiation with the flame to this day. Fire lookout towers stand as beacons in the everlasting conversation between natural processes and human interests. They are an important part of American history as well as environmental history and their preservation is saving incredibly unique historic resources that make our public lands even more compelling.